In today's world, a company's data is one of its most important assets. A primary function of the IT department is to ensure that the data is safe and always available throughout the organization. Hardware failures, power outages, communications failures, and natural disasters all put business-critical data at risk of being permanently lost or inaccessible for extended periods of time. With the 9.1 release of the Sunbelt Data Manager, our customers are armed with a new tool to protect this valuable resource and ensure its availability - Data Replication onto backup or secondary servers. This solution for both Windows and Unix/Linux servers provides unattended replication of data across local and wide area networks. For existing users of the Sunbelt Data Manager, adding data replication could not be easier. Simply obtain a license for the backup server, install it, add the replication parameters to the primary server's configuration file, and let the replication software do the rest. When the backup server comes on line, it will be brought up to date by the primary Data Manager. 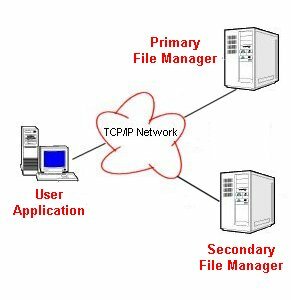 Once synchronized, all data modification requests made to the primary Data Manager will also update the backup server. The implementation of replication in the Data Manager does not require the use of "Managed" files. While the performance enhancments provided by the Data Manager for Sunbelt indexed and aamdexed files are well known, some data such as word processing documents or spreadsheets do not fall under its control. These vital files may still be protected by the Data Manager by simply configuring directories and optionally subdirectories that should be replicated. Regardless of the content, the data is safe. An important feature of the replication system is the fail-safe function. Should the primary server fail or lose its communications link, the backup server will assume control and begin servicing client requests automatically. No loss of data will occur. Once the primary server is restored, it will be updated from the backup server and remain a secondary server until instructed to resume its primary role in the network. By adding simple program logic to PL/B programs, this fail-safe function can be totally transparent to user applications. A primary benefit of the Sunbelt Data Manager has always been the reduction in network traffic when compared to unmanaged data accesses. The data replication system continues that spirit for managed files. When communicating with the backup server only changes in data are transmitted thereby minimizing the demand on systems and networks (a critical issue when replicating data over long distances). Sunbelt Data Manager Replication is an ideal backup solution for a department or a small/medium-size business. With replication, an IT department can establish a variety of automated and scheduled backup procedures that eliminate the need to disrupt user work activity during the daytime as an alternative to midnight backup sessions. By using Data Manager replication, organizations can be assured that in the event of a failure or disaster, the data will be protected. Disaster recovery is critically dependent upon the ability to seamlessly replicate data over a wide area. The Sunbelt Data Manager provides the ability to easily and securely establish an off-site location for data storage and protection. The ability to replicate only changed data asynchronously makes the Data Manager the fastest and most effective solution for wide area data mirroring available today for our customers. Sunbelt always brings ease of installation and use to its entire product line. Data Manager Replication can be installed on existing systems and is typically up and running within minutes. Of course the performance benefits of the Data Manager are well known. This product has been providing network-based application systems with improved performance for years. Please note that each Sunbelt Data Manager (primary or backup) requires its own license.